The full-time, Global Social & Sustainable Enterprise MBA is designed for passionate professionals who are committed to developing innovative entrepreneurial and business solutions to complex global challenges. This class of MBA students is focused on creating a cleaner, safer, and more sustainable world. Over the course of 16 months, students complete 41 credits in a three-semester format. A 40-day summer field placement contributes to the hands-on nature of the program, which sets it apart from traditional MBAs. The program has one August start date each year, and all classes take place on-campus in Fort Collins from Monday to Friday. 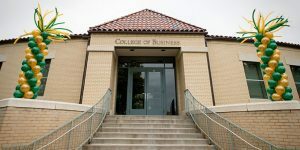 While many of the core business classes are the same as the other MBA programs, the Global Social & Sustainable MBA offers more classes focused on sustainability in the global business environment. Students take the same schedule of courses, with no room for elective options. Students in the Global Social & Sustainable Enterprise MBA originate from over 40 different countries. The tuition rate for the CSU Global Social & Sustainable Enterprise MBA is $37,391 for Colorado residents, and $59,853 for nonresidents. This figure includes fees covering transportation, technology, and facilities. The school offers a number of scholarships and fellowship opportunities for students, including international scholarships and sustainability scholarships. Students must be accepted to the MBA program before accessing the relevant applications. Although the official early deadline for fall entrants is February 1, the admissions committee notes that students are encouraged to apply as early as possible, as decisions are made on a rolling basis. A completed application includes a data form, official transcripts from all institutions attended, an academic performance explanation if the most recent GPA is below a 3.0, three professional recommendations, GMAT or GRE scores, a statement of purpose, and a current résumé. While prior work experience is not a requirement, at least two years is strongly recommended.